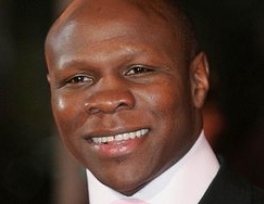 Chris Eubank (born Christopher Livingstone Eubanks on 8 August 1966) is a former boxer and British celebrity who held World Middleweight and Super Middleweight boxing titles. He was world champion for over five years and undefeated as a middleweight. Christopher Livingstone Eubanks (later opting to delete the 's' from his surname) was born on 8th August, 1966, in Dulwich, London and spent his early days in Jamaica (from two months old to six years old). On his return, he lived in Stoke Newington, Dalston, Hackney and then Peckham. He grew up in poverty. Chris attended Bellingden Junior School, and then Thomas Carlton Secondary School from where he was suspended eighteen times in one year and then expelled, despite trying to protect other children from bullies. He then attended Peckham Manor School, from where he was suspended five times in four weeks and then also expelled for the same reason. Chris was then put into care and spent time in various institutions under the care of Social Services. His mother had left for New York when he was eight years old. At the age of 16, his father sent him to New York to live with his mother in the South Bronx. Eubank made a fresh start in the South Bronx, quitting alcohol and marijuana, attending church and studying at Morris High School (he graduated in the summer of 1986). In his spare time he trained at the Jerome Boxing Club on Westchester Avenue (his older brothers, Peter and Simon, who were twins, were both boxers back in Peckham). Eubank became obsessed with trying to improve his skills at the boxing gym and trained seven days a week, becoming an amateur boxer and winning the 1984 New York Spanish Golden Gloves. He then reached the semi-finals of the 1985 New York Daily News Golden Gloves at Madison Square Garden, which is where his reputation for controversy began as he hit the headlines for the wrong reasons after biting his opponent's shoulder. In 1997, Eubank converted to Islam: "When I realized I had sense, I was on my mother's knee in church, so I was brought up with God being the cornerstone of my life, and my understanding of Islam is that if you are a good Christian then you are a Muslim. This view some would not agree with, however this is my view. So long as you believe in doing good and not promoting badness then you are God's man or woman". - Chris Eubank, June 21, 2006.